It is March 1916 and the South African General Jan Smuts is set to lead the invasion of Germany's East African colony. Smuts commands a mixed force of British, Indian, South African and Rhodesian troops, not forgetting of course his Belgian allies and the Portuguese who will shortly enter the war. 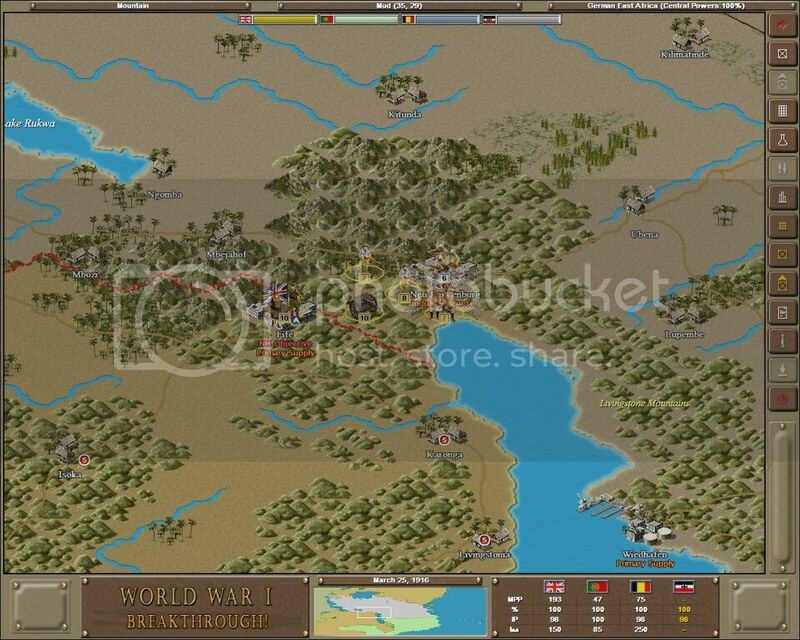 The odds are stacked against the Germans as Smuts is a veteran commander, with experience of fighting the British in the Boer War of 1899-1902, and his forces vastly outnumber the German defenders. But commanding the Germans is a man now famed for his successful use of guerrilla warfare against superior numbers, despite being cut off from support from home, and whose struggle even outlasted Germany proper: Paul von Lettow-Vorbeck. 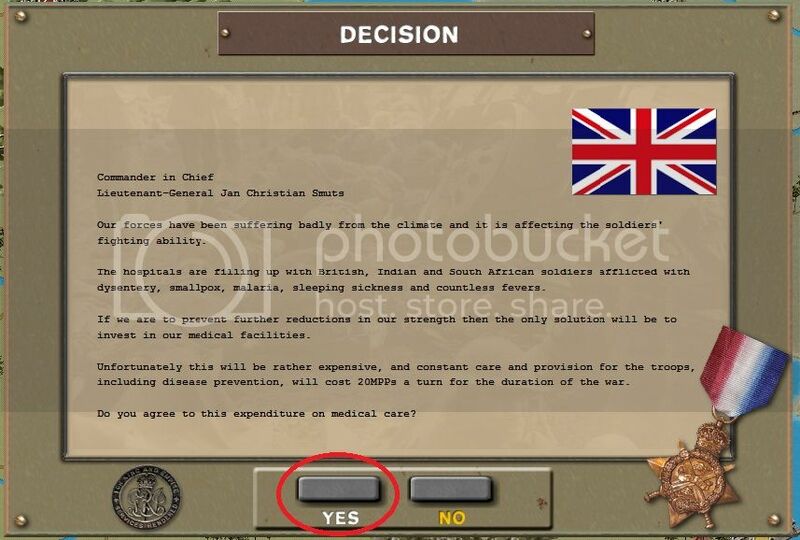 I will be playing as von Lettow-Vorbeck and commanding the German colony's armed forces, while Jim Potts aka Happycat will be leading the invasion. The British, supported by Belgian forces operating from the Belgian Congo, have the following war aims with regard to German East Africa. Before outlining those, an examination of the map is in order. As can be seen, there are four key objectives on the map: Dar Es Salaam, Morogoro, Tabora, and Ujiji. 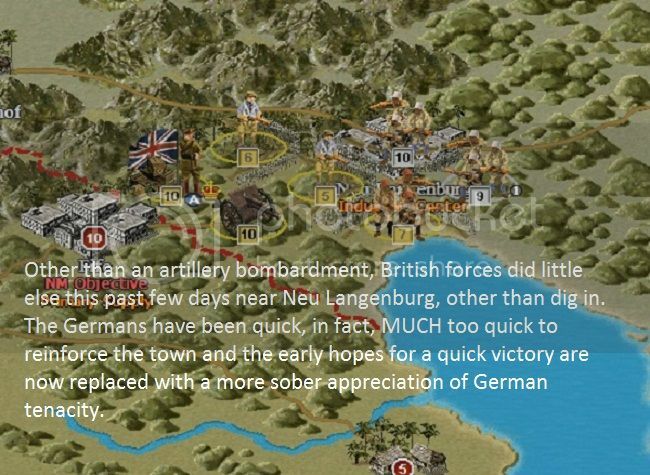 In addition, a British force operating west of Neu Langenburg will move quickly to secure that town, before the Germans have a chance to reinforce it. While Neu Langenburg is not a key objective, its capture certainly anchors the Entente position in that region. The ultimate goal is the complete eradication of any semblance of a German military presence in East Africa. Their commander is a wily fox, and blessed with a great fighting spirit. 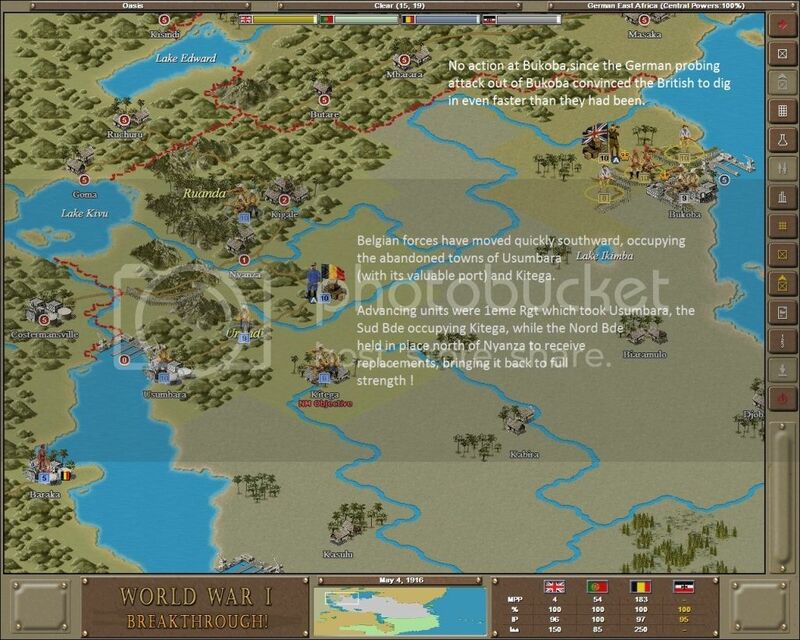 It is not expected that the German forces will lose heart, nor will they surrender easily. 1. Van Deventer's force comprised of 1st South African Cavalry, 3rd South African Brigade, 2nd East African Brigade, 1st East African Brigade, 130th Regiment, 63rd Regiment and supported by the East African Heavy Artillery will engage German forces at Taveta, either defeating them in place or forcing them southward. The advance will then proceed south to Morogoro as quickly as possible, with the aim of capturing that town. 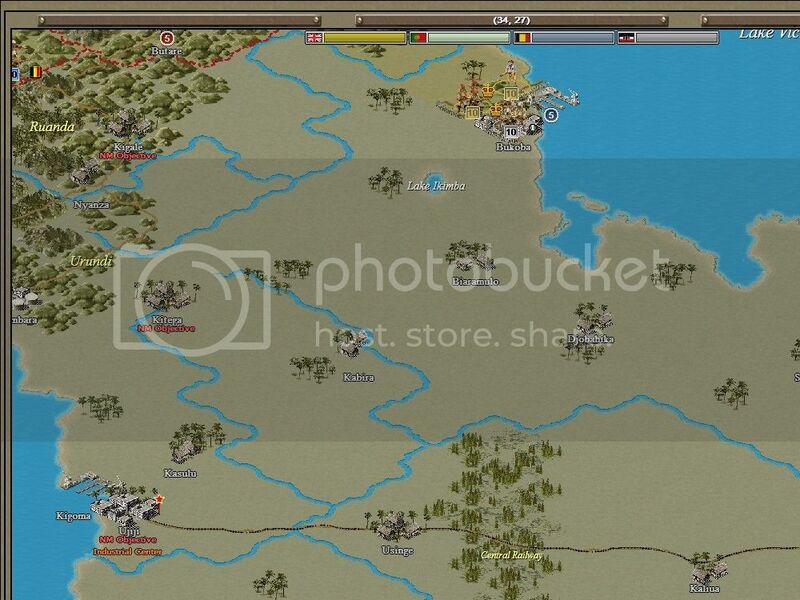 In conjuction with this movement, the Mombasa Defense Regiment is tasked with the capture of Jasin. This will force the Aksari detachment at Tanga to remain in place, denying its use for any operations which the fertile imagination of von Lettow-Vorbeck might concoct. A further operation in support of Van Deventer's force will be conducted by Tighe's group advancing south from Longido to Arusha. 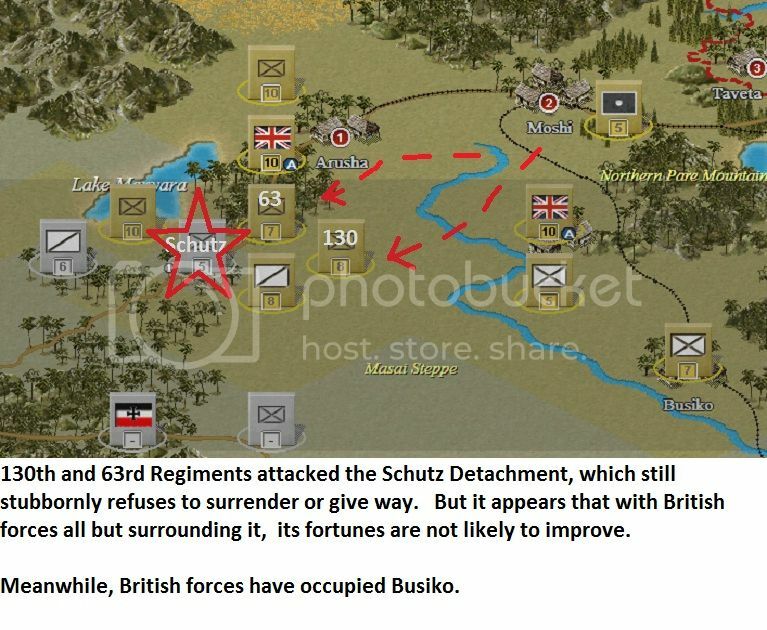 The capture of Arusha, done quickly enough, will ensure that German forces retreating away from Van Deventer's force will be unable to move west and will be compelled to move towards Busiko. 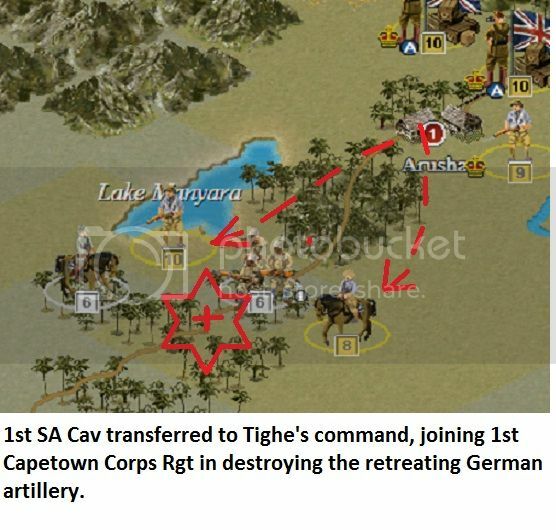 Tighe's 2nd South African Brigade will be reinforced by the addition of 1st Cape Corps Regiment, 17th Indian Regiment and if the situation permits, and once local defensive levies have been raised, also the Nairobi Defense Regiment. No decision has yet been made as to whether Tighe's force will support Van Deventer's drive on Morogoro, or proceed independently westward through the mountains towards Kondoa Arangi. The cutting of the Central Railway at Dodoma could be a very worth objective for Tighe and his men. 2. 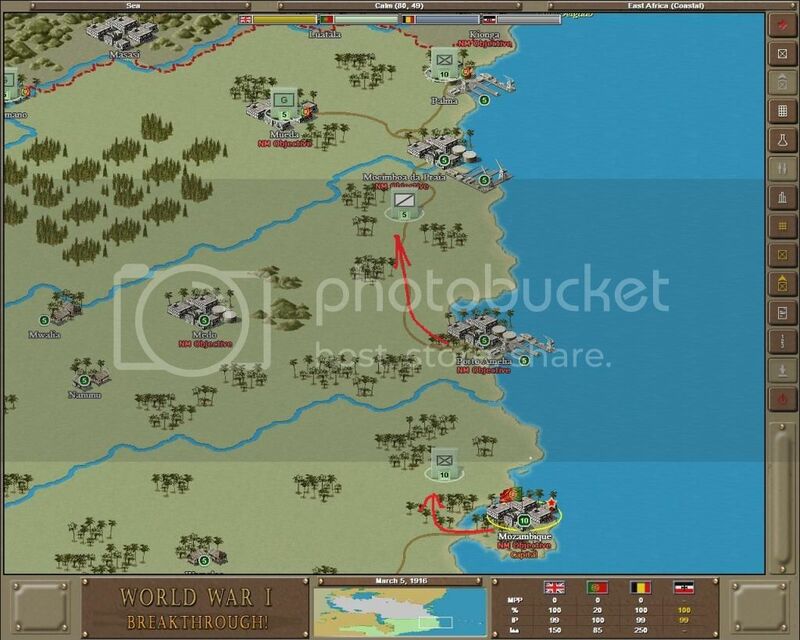 The Belgians, operating from Ruchuru, under command of Tombeur, will advance south as quickly as they can, with the goal of capturing Ulithi. With a force of two brigades, supported by a regiment from Ruchuru, this will be no easy task, as German opposition is expected to be fierce. 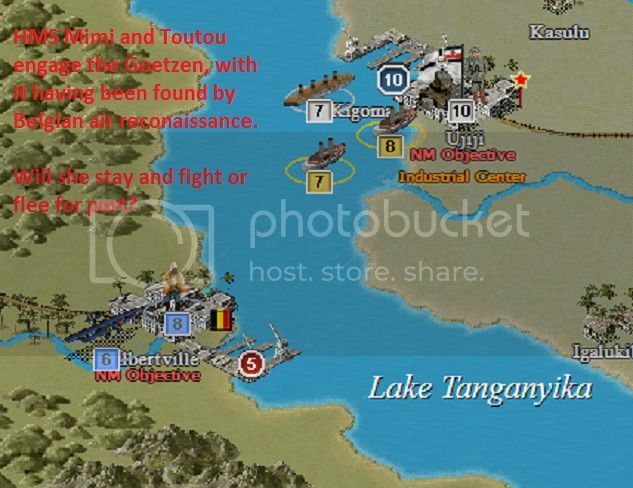 A key to this operation will be achieving naval dominance of Lake Tanganyika, which will permit the easy reinforcement of Tombeur's force by ferrying troops from Albertville to the German port of Usumbara, once it is in Belgian hands. Additionally, it may be feasible to launch an amphibious assault acrros the lake, so as to surprise the Germans with a landing to the south of Ulithi at the same time as Tombeur is closing in from the north. There is also a British force at Bukoba, commanded by Crewe and comprising 4th Kings African Rifles and two supporting regiments. While this is not a formidable force, it is sufficient to keep German forces interested in what might be going on along the shores of Lake Victoria. 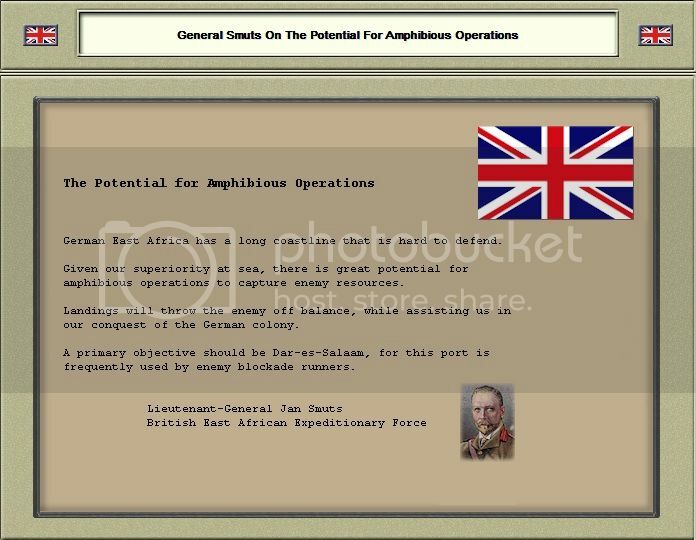 Mwanza is a worthy objective for this force, and again, finances and circumstances permitting, an amphibious assault might be more efficient than an overland march. 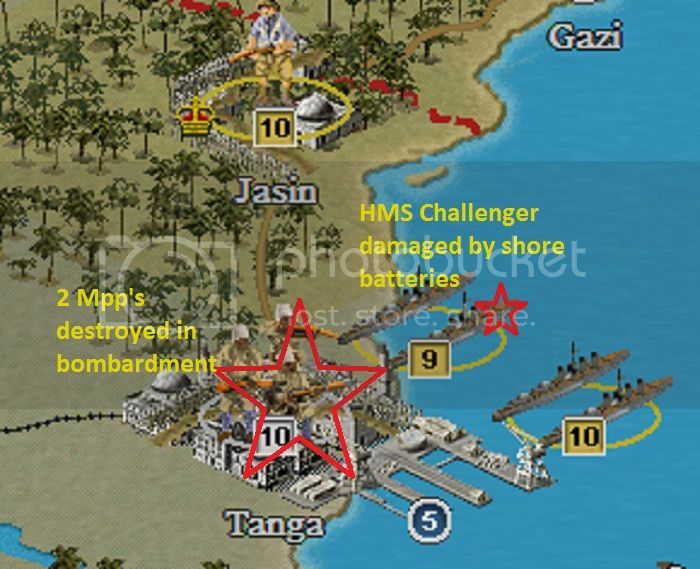 Naval supremacy on Lake Tanganyika is by no means assured, but it is achievable with a bit of imaginative planning coupled with some luck. Portugal's position deserves some examination. It is expected that the Poruguese government will shortly join the Entente. 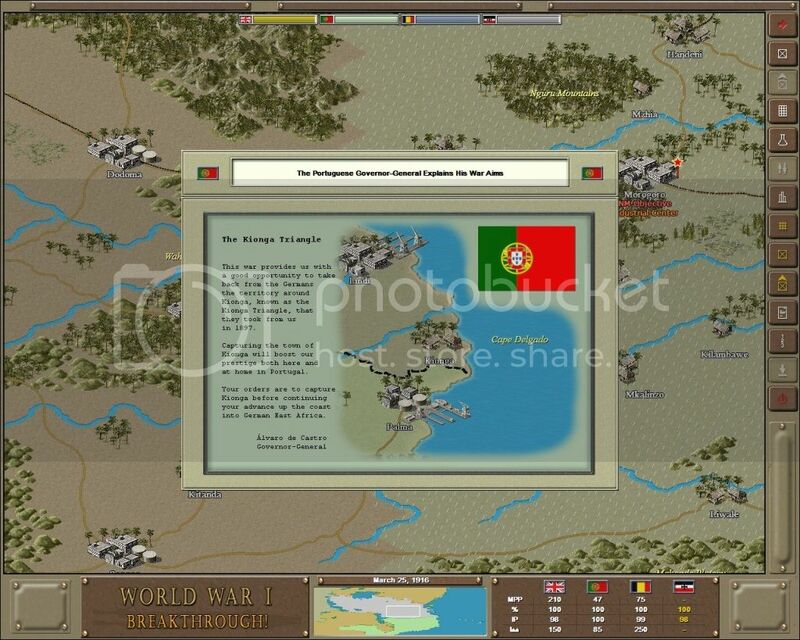 Portugal views the capture of Kionga as an important objective, and they will likely launch an attack in that direction at the earliest opportunity. 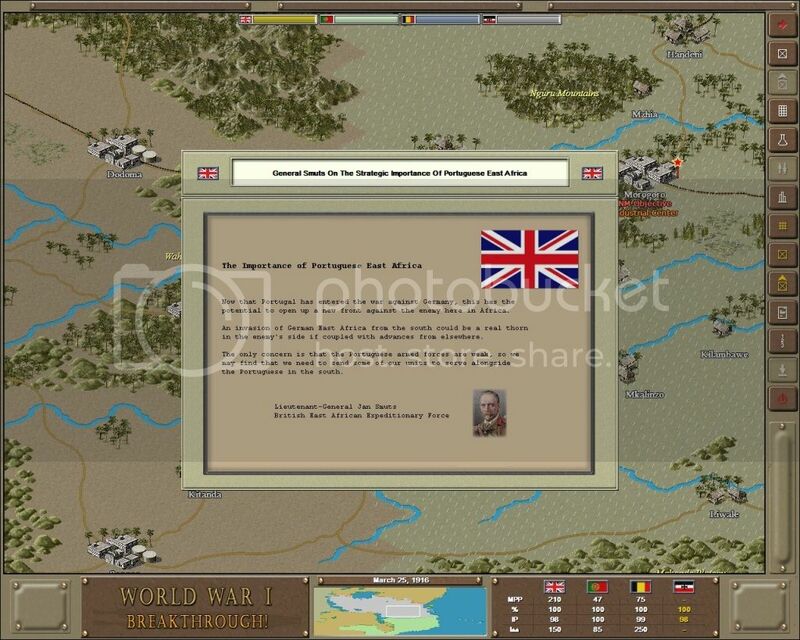 However, there is some doubt in London, and this doubt is shared by Generral Smuts, that the Portuguese forces are capable of achieving this goal, and certainly they can achieve little more without significant help. Indeed, General Smuts has commented that the Portuguese may be hard pressed to hold onto their colony in Africa, should the Germans make any serious attempts in that direction. In short, we must keep a careful and watchful eye on the situation in Portuguese territory. The British force driving on the German colonial town of Taveta has enjoyed great success in the early going, destroying the Kraut detachment in the hills east of the town. 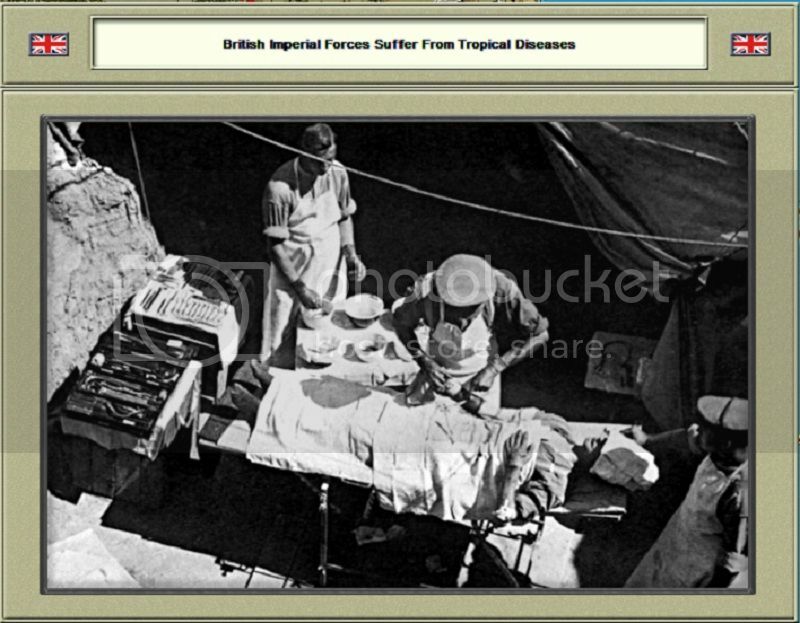 British losses were moderate. 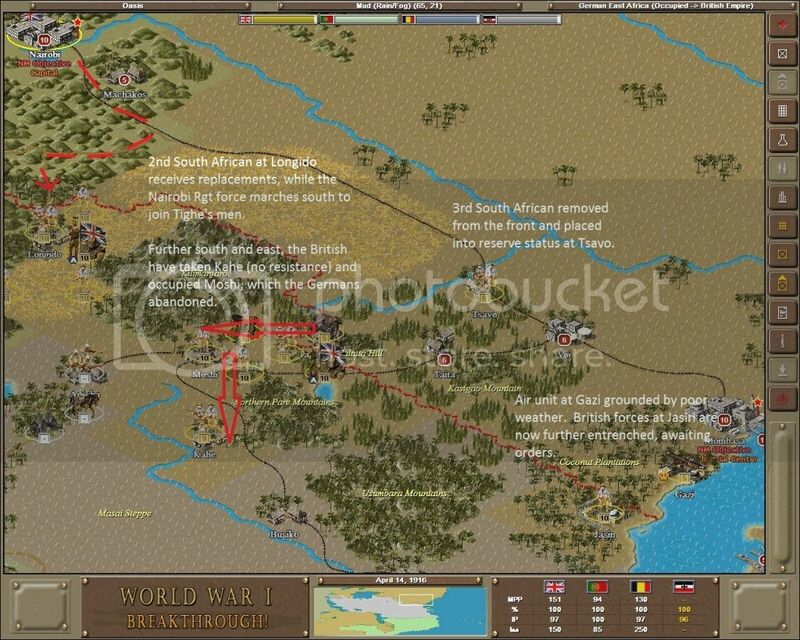 At the same time, reconnaissance shows that the British force approaching from the north towards Arusha has little to worry about, beyond a Germany cavalry unit in the town. 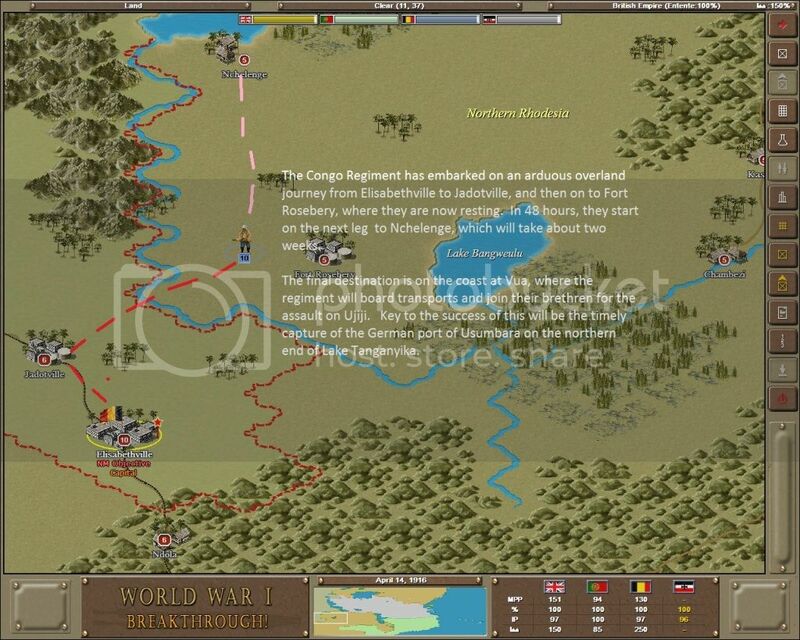 A Belgian force probed the defenses of Kigale, finding determined resistance. 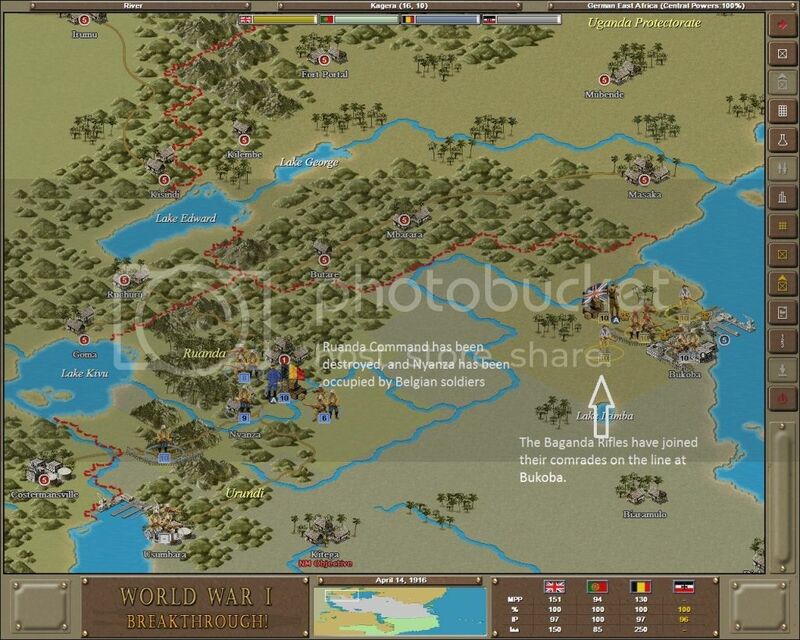 Both sides suffered approximately 20% casualties before the Belgians withdrew to await reinforcements. A Belgian unit approaching eastward from Costermansville encountered no resistance in the mountains north of Usumbara, but scouts reported back that the town appears to be well defended by the Germans. A large force of British and colonial troops, with artillery trailing behind them, are at the perimeter of Neu Langenburg, digging in and preparing emplacements for the big guns. There have been no reports of any fighting as yet. 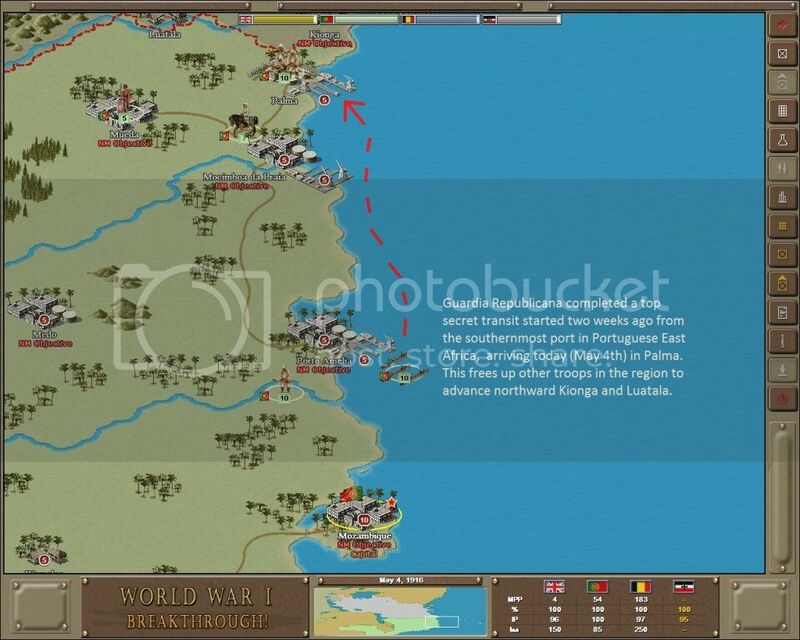 As Portuguese troops were reportedly moving north towards the border with German East Africa, a report was received from Lisbon that Germany has declared war on Portugal. It is apparent that the scenario that General Smuts and other Entente leaders had been concerned about is now a reality. Will Portugal be a help, or a hindrance in the weeks to come? General Smuts has begun his invasion with a large scale attack on our positions on Salaita Hill near Taveta, while the Belgians are advancing into Ruanda to the west of Lake Victoria. We cannot defend everything and the enemy are too strong for a passive defence to succeed, so we will have to adopt a mobile strategy. Fortunately, and unlike our opponents, we can operate on interior lines and even the railway running from Dar-es-Salaam in the west through to Ujiji on Lake Tanganyika may come in handy for moving our Askari to wherever they are needed most. Now to battle, and we have evacuated Taveta in order to combine our forces to strike at the 2nd South African brigade to the south-west of Kilimanjaro. They are in poor supply and they take a hammering! 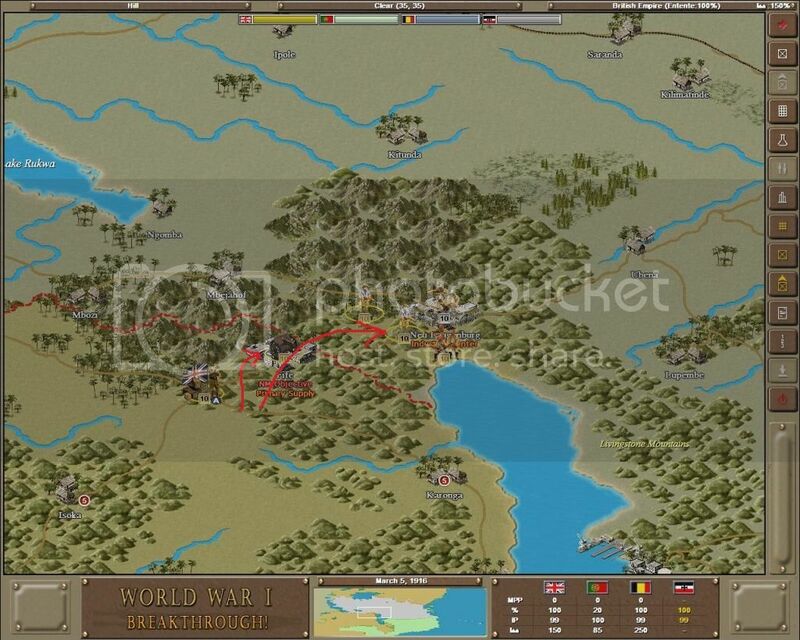 The only other attack we launch this turn is on the 1st King African Rifles near Neu Langenburg in the south west. It was also successful. Elsewhere, detachments are moving to take up operations. 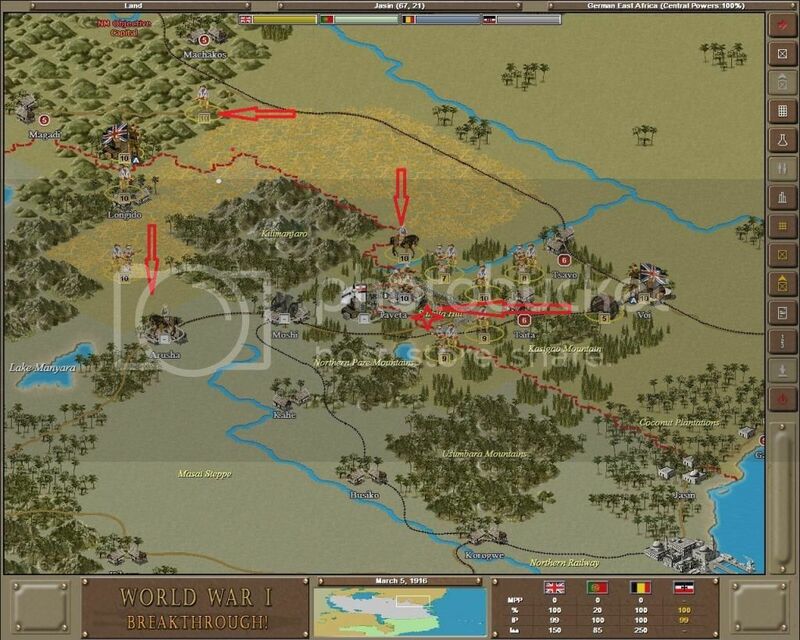 We are weakest in the north-west and cannot do much except fall back in the face of the Belgian advance. 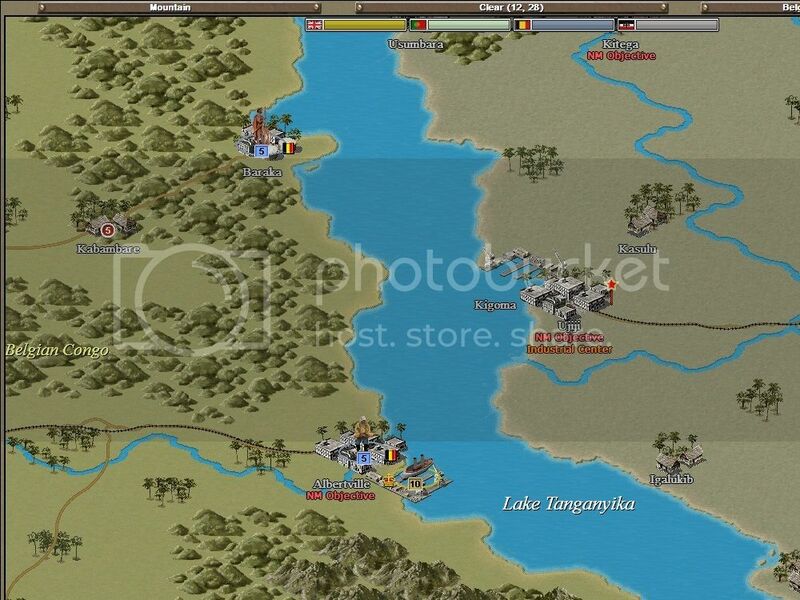 We will need to strengthen our forces near Neu Langenberg, Ujiji and along the Portuguese frontier. Our aim is not to conquer and defeat our enemies directly, but instead to wear them down, to tie up their resources and inflict casualties. The longer we hold out, and the better we do, the more effect we will have on the wider conflict elsewhere. Of course, achieving our objective may involve invading enemy territory too. While it seems we are only facing the Schultz Detachment now at Moshi, it was an unpleasant surprise for the South African Brigade which had advanced from Arusha to find German opposition much stronger than anticipated. Casualties were approximately 60% and it will be some time before that formation is ready for further action. 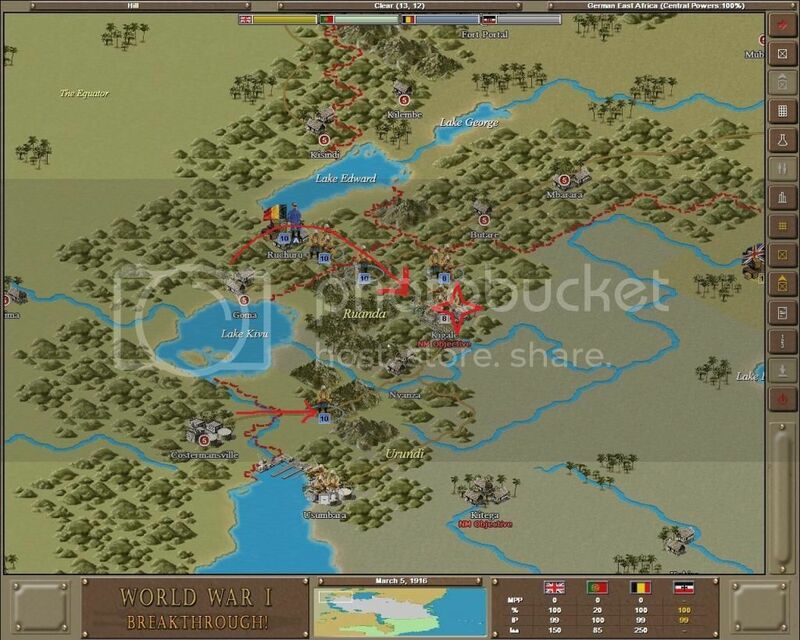 It appears that we may be facing the Fischer Cavalry detachment, as well as the Demuth Askari, and so we will now wait until supply lines on this front are improved, and bring up fresh units to resume the offensive. 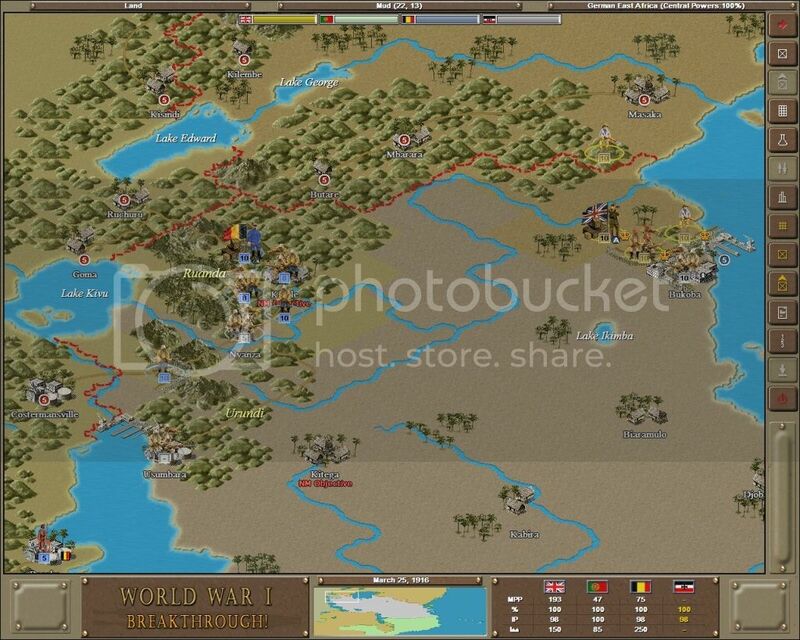 Things have gone somewhat better for the Belgians, with the capture of Kigali. 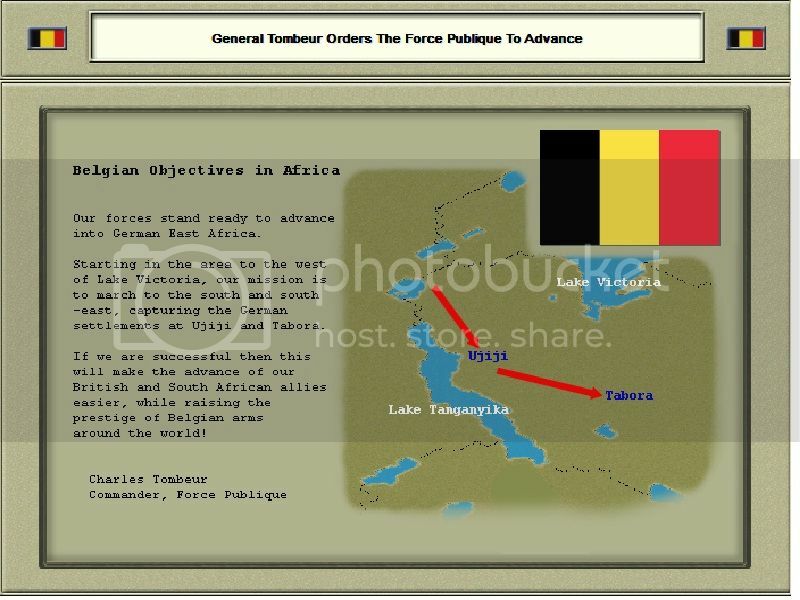 The Belgian Sud (South) Brigade hit the Ruanda Command defending Nyanza, inflicting heavy casualties. Thus far, the Portuguese have done little except move their cavalry around in grand fashion, but on the other hand, at least they haven't been a liability. 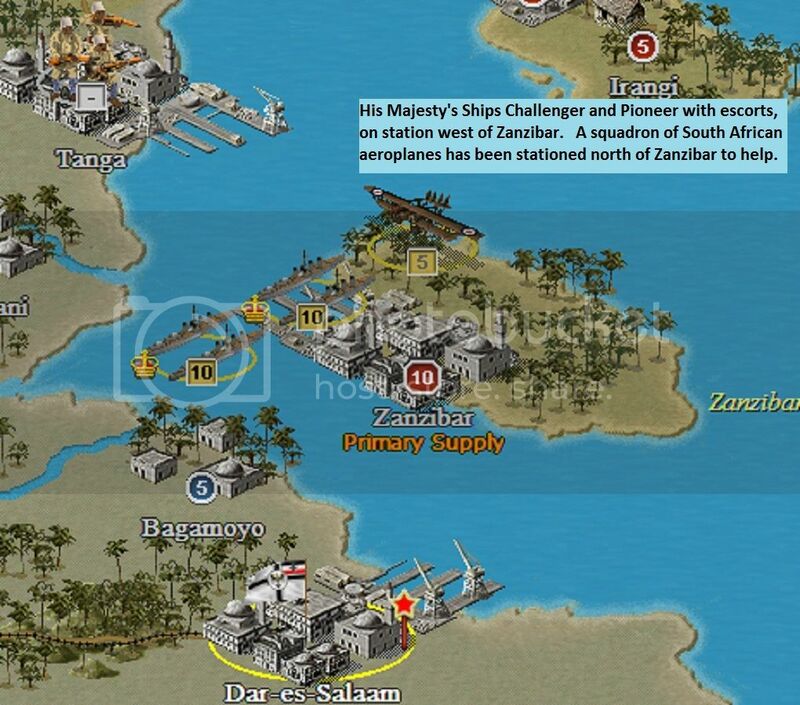 Naval HQ reports no action at sea or on either of the great African lakes, Tanganyika and Victoria. 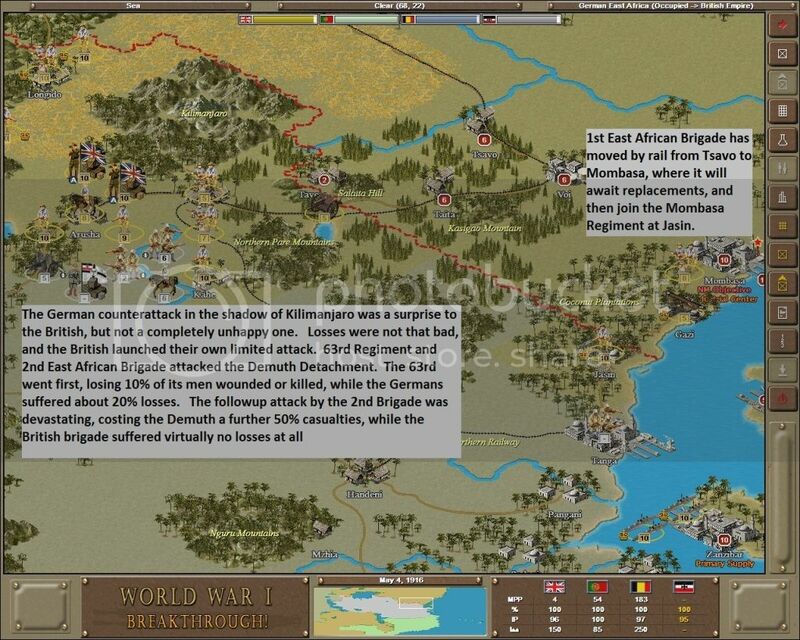 It’s good to see that the enemy are feeling a bit more cautious now around Kilimanjaro after Kraut gave the 2nd South Africans a good beating last turn. 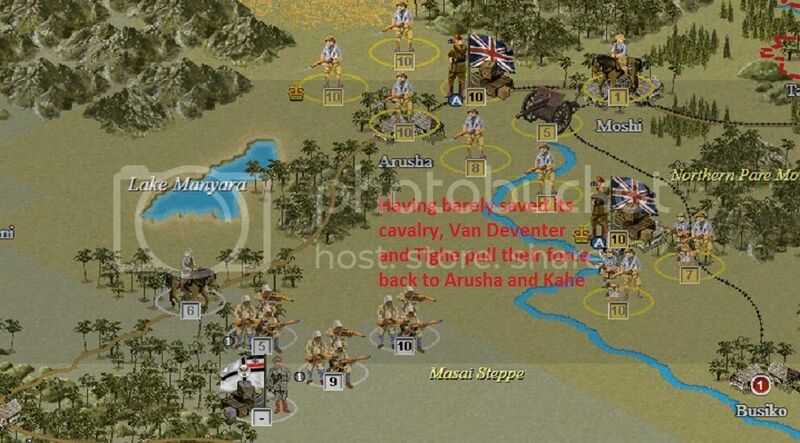 The British have occupied Taveta and advanced on Moshi to the east of the mountain, so we launch an attack on the 1st South African Cavalry and then we retire to the south. Reinforcements are arriving at Neu Langenburg in the south west, and hopefully the British here are exhausted from their exertions and won’t be able to attack again in strength for a little while. The situation in Urundi and Ruanda is a real concern, because our Askari unit is trying to withdraw south but with the Belgians hot on its heels it’s a really tough thing to do. So this turn we’re resting in Nyanza, hoping that we’ll be able to continue our march shortly. 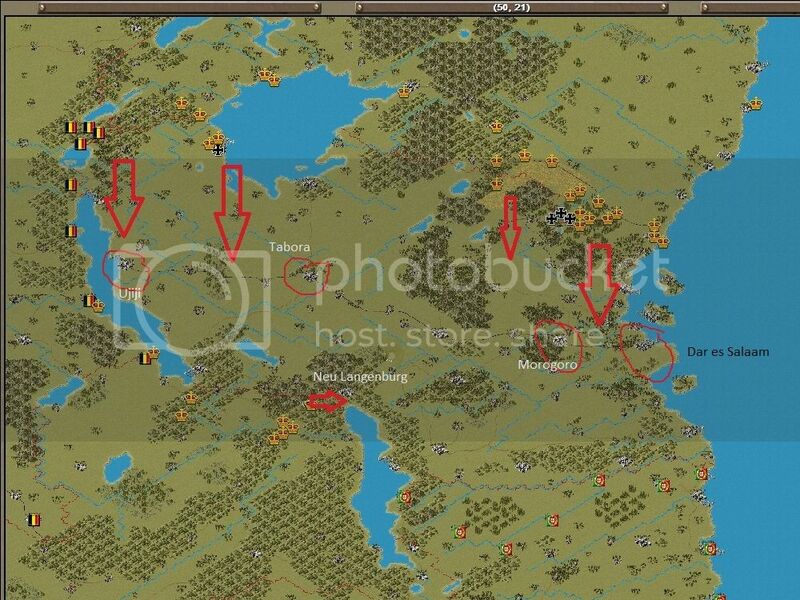 Now we’ve got an interesting decision to make, on where to deploy some guns that came off the Konigsberg. Just as with discussing von Lettow-Vorbeck’s movements, it would be prudent for me to keep my choice quiet for the moment. Now for some good news, as a blockade runner, the Marie, has brought supplies from home, including some quinine, and better still, some artillery! As predicted, the enemy’s attack on Neu Langenburg was a complete failure. But further north in Ruanda we lost at Nyanza. We were only holding our detachment at Usumbara to provide an escape route for our Ruandan detachment, so now there is no need to remain there any more, we march on Ujiji. The next enemy target in the north west looks like being Bukoba on Lake Victoria. This is also an exposed position, hard to retire from effectively, so we will just aim to delay the enemy’s assault here. 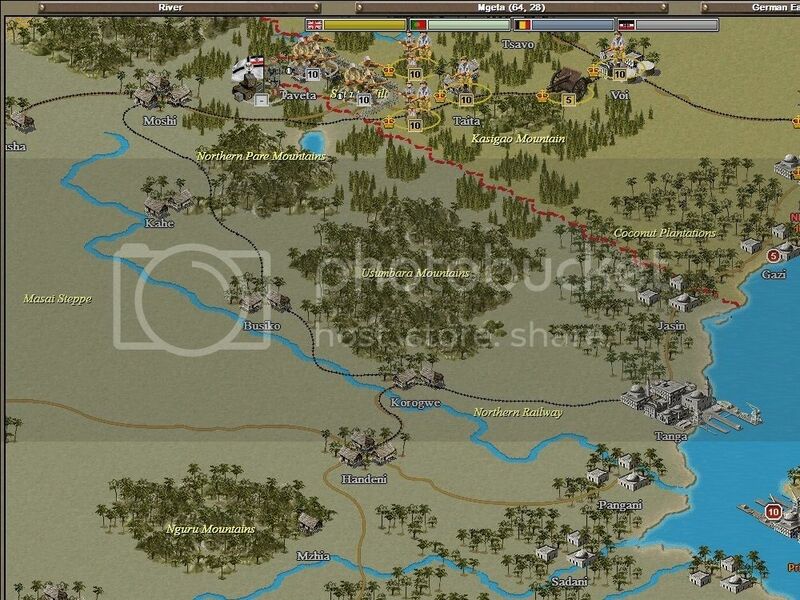 Major Kraut was a little impetuous this turn, in attacking the 2nd East African brigade. 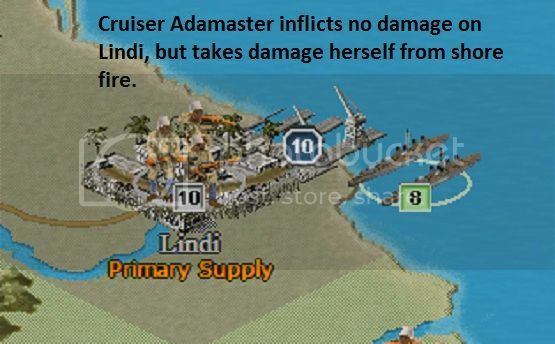 Losses were heavy for little gain, so it is a salutary lesson to conserve our strength and draw the enemy into a better place to strike them, when they are low on supply and tired from their efforts. More supplies come ashore from the Marie, and our guns are unloaded too! So far the Portuguese are quiet, perhaps fearful of what is to come? 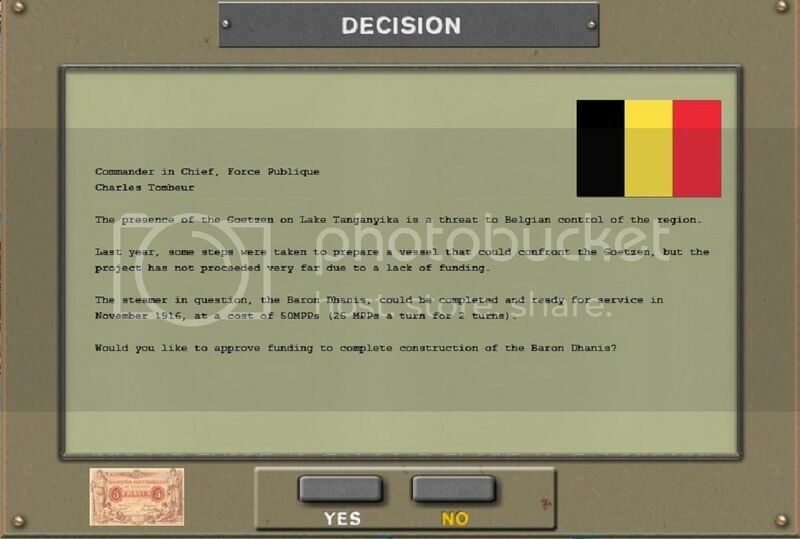 NEWS FROM BELGIAN HQ IN EAST AFRICA: C. TOMBEUR APPROVES BARON DHANIS ! Major Kraut pulls back his troops in the north east. Our aim now is to get them back to safety and reform in a better position. The enemy really did bite off more than they can chew at Neu Langenburg, as we almost destroyed the 2nd South African regiment. We should be able to hold here for a while now. 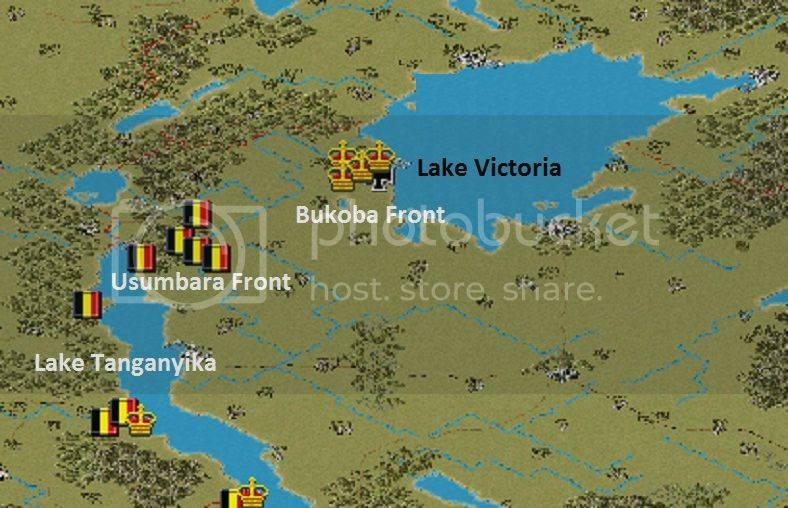 The Belgians are consolidating their position now in Urundi and Ruanda, so Major Wahle is preparing a warm welcome for them when they venture south on Ujiji. 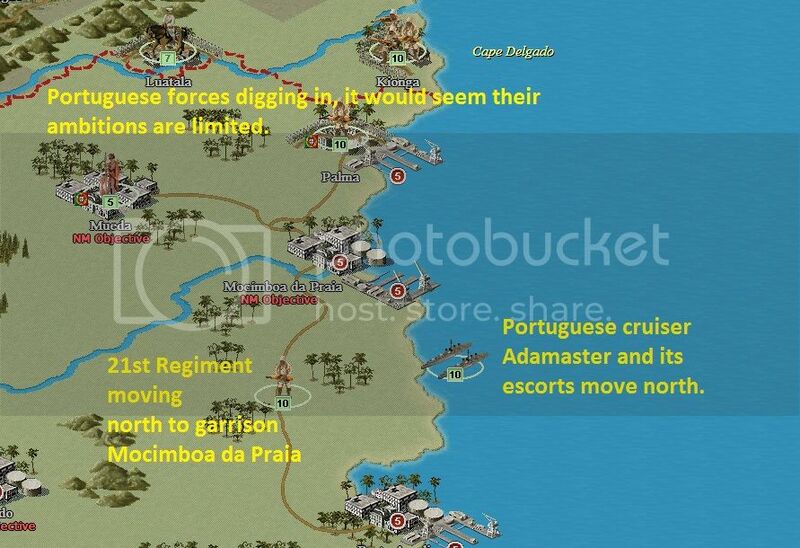 The Portuguese have finally made their move on the Kionga Triangle. We didn’t even try to defend it, but will punish them for this at a later date! 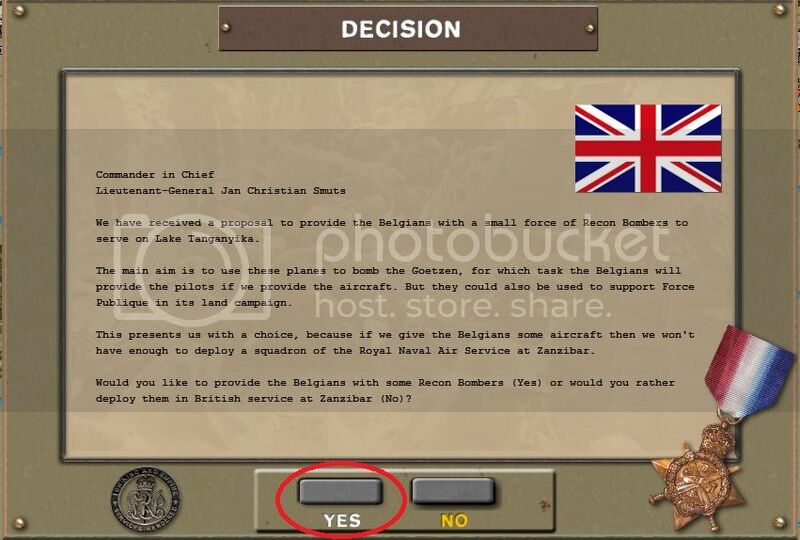 A most excellent AAR. A fascinating campaign. May 24, 1916 NEWS FROM EAST AFRICA. 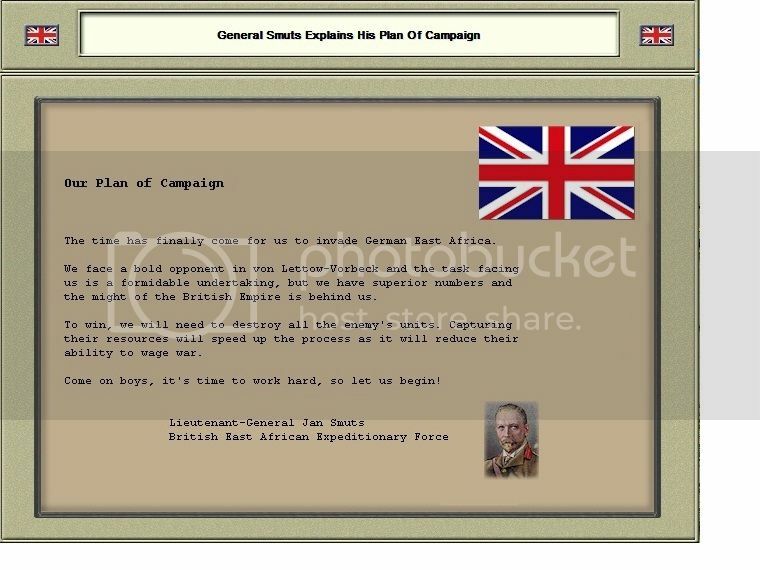 General Smuts adjutant, Colonel J. Potts, has advised the various news organization representatives, to be prepared for some big news very soon. While he was not specific, he did say to look to Lake Tanganyika or Lake Victoria as being the scene for some action of a "most interesting nature" and utilizing methods of warfare "that are very new and innovative". Perhaps the recent lull in activity at Bukoba or Usumbara is the calm before the storm! 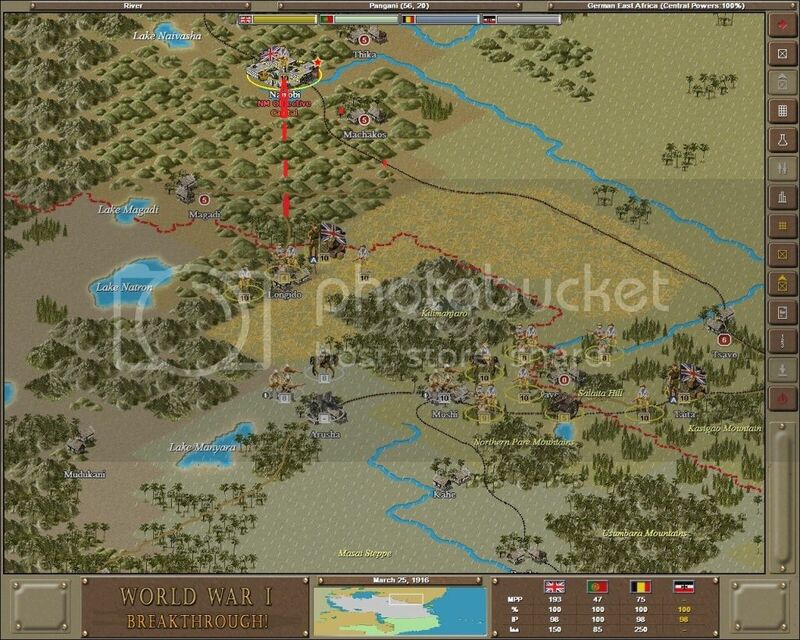 We avenge our artillery by giving the 1st South African cavalry a battering they won’t forget! All our units are back in supply with Major Kraut preparing his next set of orders. 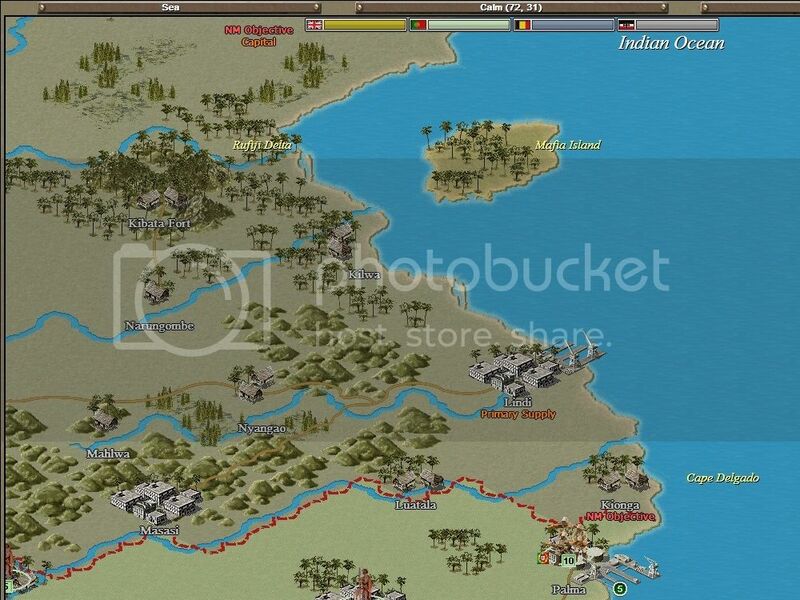 All is quiet in the north west as the Belgians haven’t yet followed up their capture of Urundi, and the Portuguese are wisely restricting themselves to just consolidating their gains in the south east. 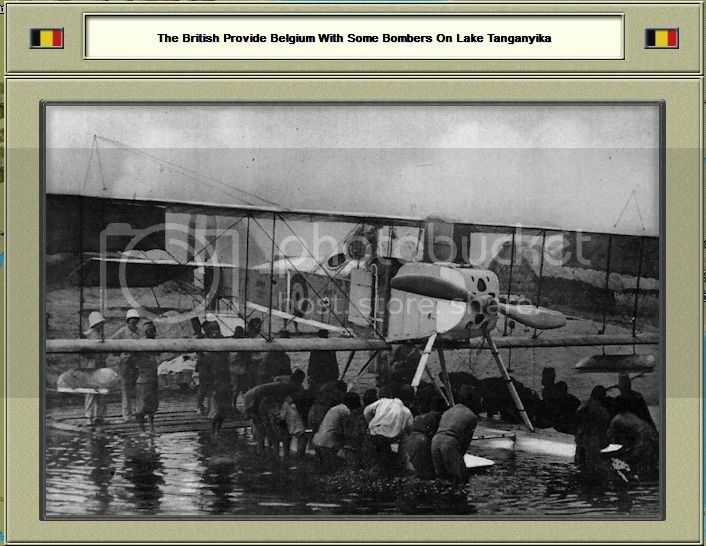 The Graf von Goetzen must be successfully making a nuisance of itself on Lake Tanganyika, as the British have just provided the Belgians with some aircraft to attack it. It looks as though the enemy are preparing further offensives, so it’s a good thing our own forces are slowly increasing in size, and our new artillery will more than offset the loss of the old. 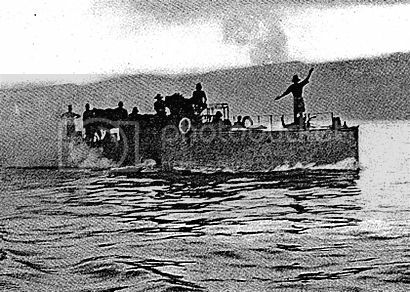 NAVAL ENGAGEMENT ON LAKE TANGANYIKA. MIMI AND TOUTOU HOLD THEIR OWN AGAINST THE GERMAN GOLIATH "GOETZEN". All other sectors were quiet. the Goetzen is still shipping on Lake Tanganyika, today it is called MV Liemba. The Graf von Goetzen survives combined air and naval attack, beating off Mimi and Toutou and shrugging off a bombardment by the Belgians’ new bombers. Toutou is now looking in need of some very urgent repairs. 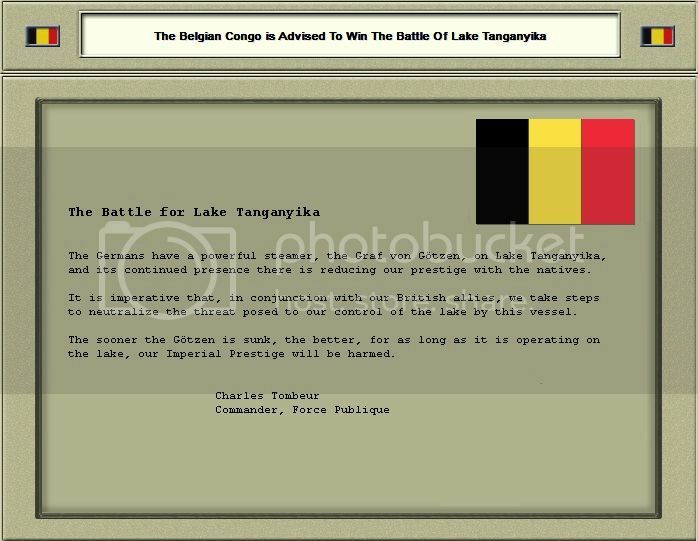 The Belgians appear to be commencing their advance southwards down the eastern side of Lake Tanganyika. Fortunately Major Wahle has just received some timely reinforcements so expect a tough battle to come! 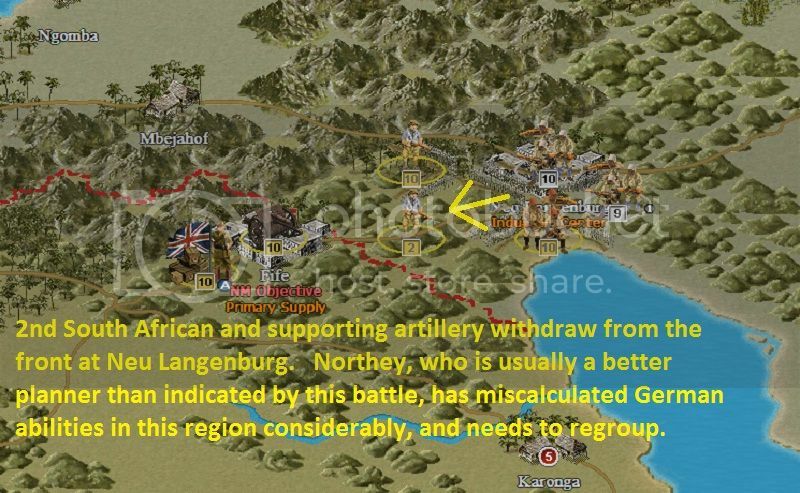 Northey is still risking the lives of his men to little avail at Neu Langenburg, as the 1st King’s African Rifles learn not to underestimate our Askari. 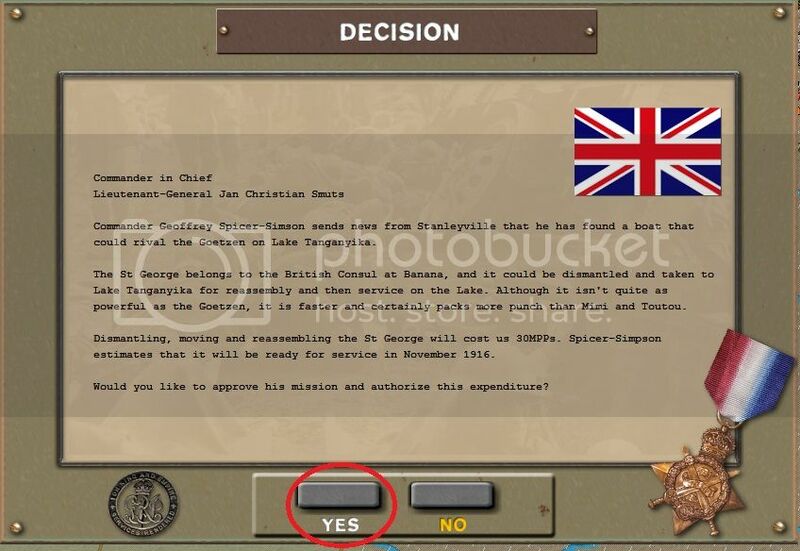 The British in the north east have withdrawn to the east of Kilimanjaro, and so as to increase the distance between our forces and theirs, Major Kraut retires to the south. We’ll take the opportunity to have a quick rest so as to be ready for further operations again very soon!